Choose the way you would like to connect with us. 1. Would You Like Us to Call You at a Specific Date and Time? Use The "Quick Connect" Button to receive a call at your convenience. 2. Call us Directly at (813) 778-9548 for information and pricing. OR simply click "Get a Quote" from anywhere on our website. Bay Area Graphics & Marketing Takes Pride in Our Design & Marketing Services Offered to Florida Business Owners. 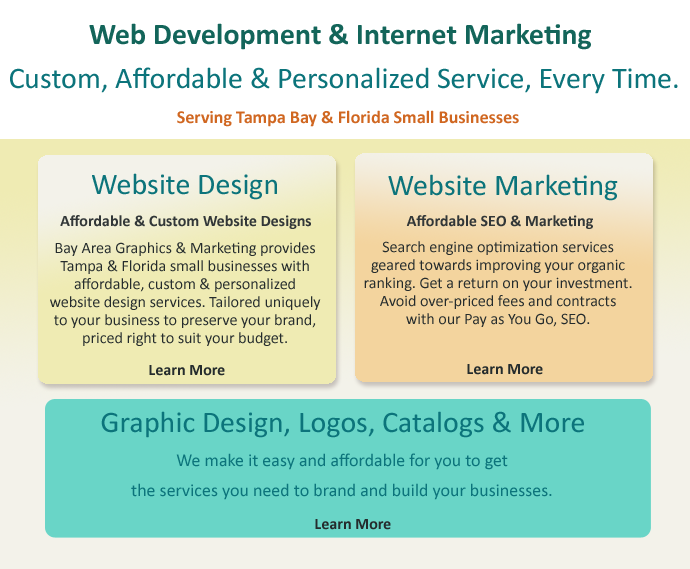 Let us show you how easy and affordable it is to obtain the design and marketing services you need to market your Florida small business. We're low key and friendly, while providing you with quality, customized, professional services. You will know we appreciate your business because we'll show it by working hard together with you to ensure that you receive the best results. Affordable web design and small business marketing tools and services available to you when you need them. That's what all Florida small business owners need. Give us a call today at (813)778-9548 and we'll provide a comprehensive quote for services tailored to your needs. Sensitive budget? No problem. We will do our best to work with all small businesses, regardless of your budget.